Here’s to a new year committed to healthy, cavity-free teeth for us and our kids! Brush each morning and before bedtime AFTER milk. Floss your children’s teeth once your dentist recommends it. 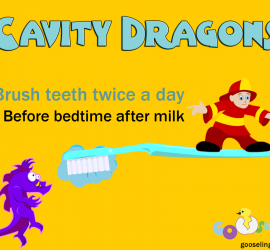 Check out our toothbrushing tips for parents at http://gooseling.com/toothbrushing-tips which includes a free story based on the Cavity Dragons app available in iTunes. Our parenting blog a forum to share experiences and tips from parents and guest authors. Nothing shared here should be construed as medical, safety, or other professional advice. Please consult with your medical or other practitioners to determine what is best for your situation.